Simon Cowell was given a written caution by police for walking his dogs in a pet-free zone on Miami Beach. 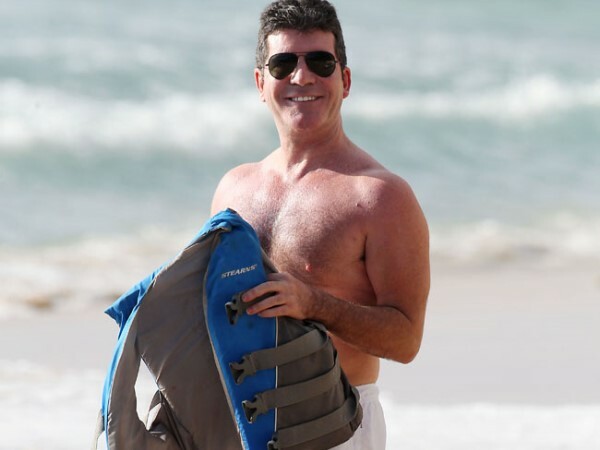 Simon Cowell was given a police warning for bringing his dogs to the beach. The X Factor judge caused a scene while holidaying in Miami with his girlfriend Lauren Silverman and their baby son Eric when he was cautioned for walking his beloved Yorkshire Terriers, Squiddly and Diddly, in a pet-free zone. Simon was spotted cosying up to Lauren on a sunlounger on Miami Beach during 11 day old Eric's first visit to the seaside, with his pet pooches roaming freely around them and one even licking the tiny tot's face. When the music mogul decided to stretch his legs along the Bal Harbour resort waterfront, a police officer arrived to give him a ticking off for ignoring a sign which clearly stated no dogs were allowed on the beach. The 54-year-old star escaped with a written warning and looked relieved since the offence usually results in a $200 fine. An onlooker told the MailOnline: "[Simon] told them he would not do it again and seemed happy that he got away with a telling off." The TV personality was later seen grinning and posing for pictures with a crowd of admiring women. This comes after Simon hired a dog expert named Edward Alava to ensure the puppies - who he adopted in October - were able to adjust to the newborn's arrival. A source said: "Edward advised Simon on how to familiarise the dogs to Eric, telling Simon to put one of Eric's blankets in the pup's basket so they could get used to the newborn's smell."